Happy Holidays! | Mmm, Tasty! 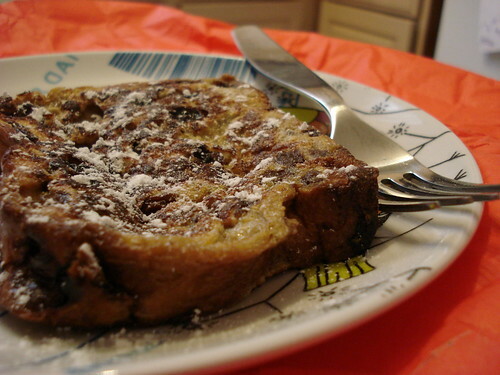 For now, here’s a quick shot of our Christmas morning breakfast: Grand Marnier French Toast made with cinnamon raisin bread, which Rich whipped up for us. We nabbed the recipe from here, but apparently it was originally published in Bon Appetit. I’ve also posted it below. Eight 3/4 inch thick slices of French Bread ** we used thick slices of cinnamon raisin bread, which was really delicious. Whisk together the eggs, half and half, Grand marnier, sugar, grated orange peel and vanilla extract. Dip the bread slices into this mixture and place into a large baking dish (13×9). Pour the remaining mixture over the bread in the baking dish and let stand for twenty minutes. Melt the two tablespoons of butter in a heavy skillet over medium heat. Add bread slices and cook until brown and cooked through. Add butter to skillet as needed to cook remaining bread. To keep cooked slices warm until serving, place on a baking sheet in the oven on low heat. Serve with powdered sugar and warm maple syrup. This dish can be prepared a day ahead of time, covered and refrigerated. Take out of refrigerator at least 1/2 hour prior to cooking. * The original recipe noted that thawed frozen orange juice concentrate can be substituted for Grand Marnier. But honestly, use the Grand Marnier if you can. It’s much more tasty!